You have a heart to help care for those who can't care for themselves. Regent's Bachelor of Science in Healthcare Management – Nursing Home Administration will equip you to effectively lead, direct and manage long-term care centers and nursing home facilities. Explore critical issues and market forces affecting the nursing home industry while learning the fundamentals of healthcare operations, informatics, marketing, accounting, organizational dynamics and more. Explore approaches to improving quality of life for the elderly and chronically ill, and those needing convalescence and rehabilitation. Understand the continuum of care in the U.S. healthcare system and make ethical managerial decisions. Recommend solutions based on data-driven assessments. 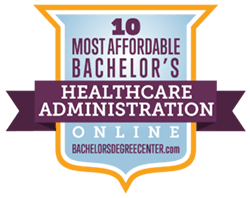 Pursue licensure as a long-term care or nursing home administrator. Examines macroeconomic theories, comparative economics, econometrics, macro-economic models, fiscal and monetary policy formation and analysis. Prerequisite: ECON 120 or ECON 260. Various components of the U.S. healthcare system over the entire continuum of care. Attention given to private and public financing mechanisms, the forces of market competition, government regulation, and the impact of health policy on key stakeholders. Presents students with a variety of healthcare career options. 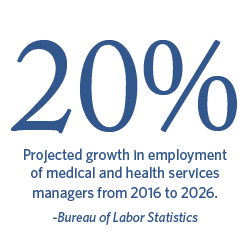 Day-to-day operational management of healthcare organizations including hospitals, private practice, ambulatory settings, and specialty services, with a focus on issues influencing the administration of today's healthcare organizations. Attention given to those issues that affect the delivery of care, and how decisions are made to develop new programs. Overview of public health and aging issues: demography of aging, how aging is viewed in society today, including myths and stereotypes of aging; the concept of successful aging, implications of chronic illness and disability for public health, health promotion for older adults, and other topics central to public health in an aging society. Practice in making managerial decisions in a wide variety of situations. Cases are presented that analyze current issues such as service-line management, healthcare reform, the medical home, accountable care organizations, community benefit, CEO compensation and other legal and cultural issues affecting the healthcare organization. Introduction to the management of medical information systems in healthcare, emphasizing the optimization and customization potential of computer functions in the health services environment. Exploration of organizational and cost-benefit issues related to healthcare information systems, including clinical decision-support, integrated networking and distributed computing technologies, and universal medical records. Complex financial models in healthcare organizations and the influence of public policy, the ACA and market conditions on the financial viability of the healthcare organization. Topics include financial statement analysis, working capital management, capital budgeting, cost of capital, variance analysis, financing techniques, and case studies. Prerequisite: BUSN 220. Public health policy creation and the regulation of healthcare delivery in the U.S. Social, moral, and ethical issues associated with these policy decisions and regulations, such as corporate liability, medical malpractice, admission and discharge process, informed consent, patients' rights, and confidentiality of medical records. Prerequisite: HCMT 310. Nursing home administrator competencies; clear and articulated management practices in the nursing home environment to include: 1) government oversight and interaction; 2) organizational policies and procedures; 3) principles of ethics and law; 4) community coordination and cooperation; 5) risk management; and 6) government and decision making. Overview of the functional organizational structures common to long-term health care facilities; the role of the administrator in the organization and management of long-term care facilities; projects through the various planning and implementation phases, including strategic development and space planning, comprehensive reviews of project design, construction, occupancy, and compliance with regulatory standards. Faculty approved practical experience in a healthcare organization including monitored work experience; and/or completion of a culminating management project involving submission of a written report and oral presentation building the case for a new healthcare program, policy, or expansion. Prerequisite: Senior standing.